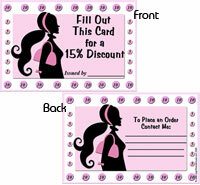 15% Discount Punch Card. Measures 4x6 inches and mails nicely in our 5x8 cellophane bags. 50 cards per pkg.